While the campaign to save Churchyard Bottom Wood was run and directed by local people who felt passionately about this particular piece of woodland, they called on the help and experience of a vast network of people, some of whom had worked together on similar campaigns for over thirty years. 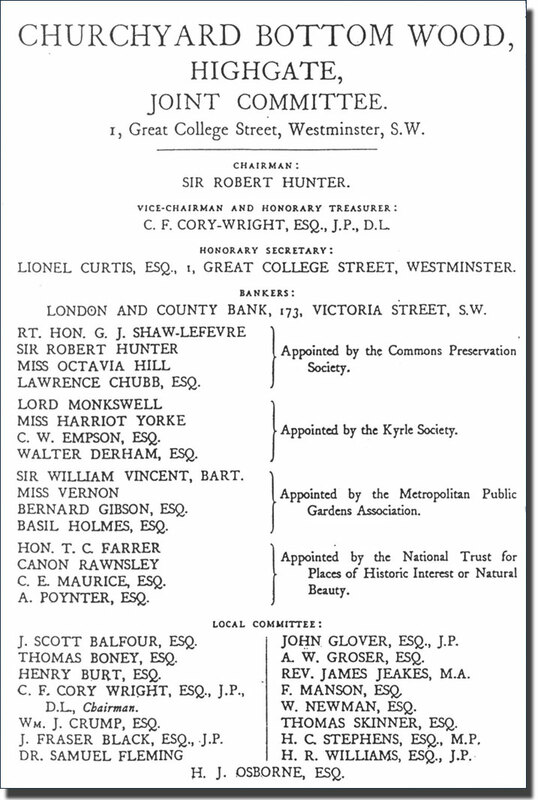 The Committee issued an appeal, printed on very good quality paper and bearing some famous names. The questions of open space and public health were major subjects of the Victorian vision. Octavia Hill, the great housing reformer, who had begun with three old houses in Marylebone, bought for her by John Ruskin, had quickly become an expert on housing poor people in the healthiest conditions possible. Her way was to buy leases and then knock down some of the crowded houses in order to bring light and air to the rest, believing that fresh air and sunlight were the the only way poor people could be saved from 'putrid fever'. She had learnt this as a child from her grandfather, Southwood Smith, who developed his theories at the Fever Hospital at King's Cross. He had built the first Industrial Dwellings for poor people and had proved statistically that good air and decent drainage saved lives.